Bonnie Ora Sherk, Portable Parks II, 1970. Mission and Van Ness, San Francisco. January 29, 11:00 a.m.–8:00 p.m. Continuing January 30–February 4, 10:00 a.m.–9:00 p.m. and February 5, 11:00 a.m.–8:00 p.m. In the 1970s, Bonnie Ora Sherk created performance installations that brought the experience of nature into unexpected locations in the urban environment. For Portable Parks I–III (1970), seen at the right, she imported turf, palm trees, picnic tables, bales of straw, as well as live farm and zoo animals to San Francisco streets and elevated freeway ramps. Since the 1980s Sherk has been engaged with her project, A Living Library (A.L.L), a multi-year, systemic framework for creating place-based ecological change. 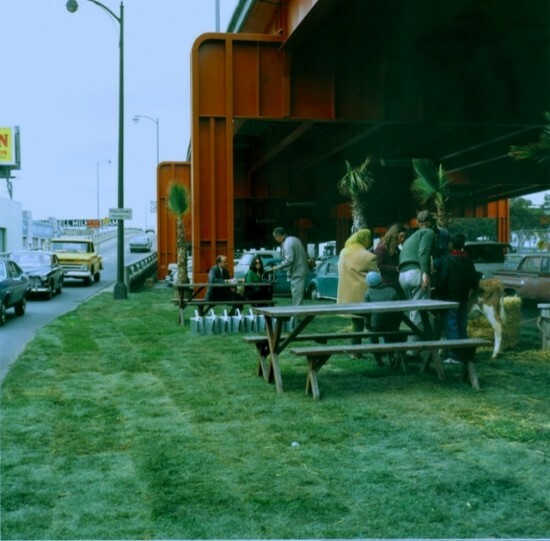 Working with curator Karen Moss, Sherk and Otis Public Practice Graduate students have re-imagined what a “portable park” is today, more than forty years later. Their project at Santa Monica Place includes Sherk’s California Native Zones, mini-gardens of drought-tolerant plants and The Flower Unfolding, a monumental-scale, organic edible landscape consisting of fruit trees, vegetables, herbs, and flowers. This is accompanied by a series of art installations, artistic/interpretive signage, performances, and public programs by the Otis artists that address issues of sustainability and consumption. During this 10-day project there will also be public programs about issues pertaining to environmental awareness, ecology, and sustainability. Portable Parks IV will temporarily transform the mall site in a highly aesthetic and multi-sensory way; raise awareness of ecological sustainability, urban agriculture and A Living Library, as well as to unveil different aspects of consumer culture to the diverse visitors to Santa Monica Place. The partners for this project are the City of Santa Monica, Cultural Affairs Department, the City of Santa Monica’s Office of Sustainability, and Santa Monica Place, Macerich. Additionally, students from the Crossroads School for the Arts and Sciences will be making hand-painted botanical labels to educate the public about all the plants in the gardens.